4k/UHD Delivery to Clients – By When? | SCRI International, Inc.
Additional research data from the same study shows that over three out of ten broadcasters and pro video facilities (30.2%) have already delivered content to clients in the past 12 months. A further 11.9% exotic to do so in the next 2-3 years and 8.7% in the next 3 – 4 years. 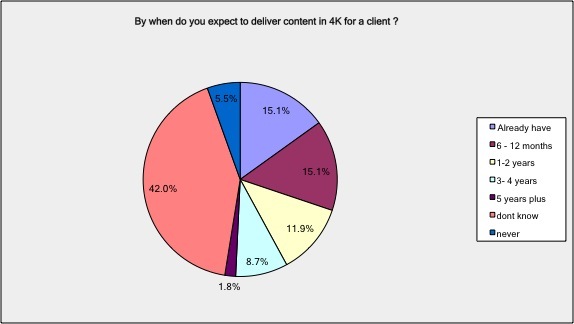 With 42% of facilities still unsure as to when they might deliver content in 4k?UHD, the actual adoption rate is likely to be much higher. I believe 4K will be eventually a success (unlike 3D). The user experience over HD is better for especially Sports and others. But, it will take several years for the end-to-end workflow to be upgraded to 4K to support it at scale. Depending on the geography, 4K can be delivered over the Internet to a percentage of customers, who have the broadband connectivity to support it and a 4K TV. Download models may happen sooner than live or OnDemand. Use of advanced codecs such as H.265 will be a must. CDNs with large capacity and ability to support very high bitrates consistently will be key as well. So all these combined, with the higher cost associated with it, I don’t expect a massive growth in 4K at least for the next two years. Experimental stuff and hype, absolutely yes. But most of the online video offerings really care about getting high quality HD (1080p) to a wide audience in consistent quality more than trying their luck with 4K. One should also consider that more and more video consumption happens on small portable devices, for which 4K has little or no value. believe 4K will be eventually a success (unlike 3D). The user experience over HD is better for especially Sports and others. But, it will take several years for the end-to-end workflow to be upgraded to 4K to support it at scale. Depending on the geography, 4K can be delivered over the Internet to a percentage of customers, who have the broadband connectivity to support it and a 4K TV. Download models may happen sooner than live or OnDemand. Use of advanced codecs such as H.265 will be a must. CDNs with large capacity and ability to support very high bitrates consistently will be key as well. So all these combined, with the higher cost associated with it, I don’t expect a massive growth in 4K at least for the next two years. Experimental stuff and hype, absolutely yes. But most of the online video offerings really care about getting high quality HD (1080p) to a wide audience in consistent quality more than trying their luck with 4K. One should also consider that more and more video consumption happens on small portable devices, for which 4K has little or no value. I am a believer in 4K. I don’t think over the air delivery is a real issue because initially at least content will be delivered using IP. Different from the SD to HD transition, with 4K displays are ready, alternative content delivery is available, with actual real time delivery not far behind and most importantly good 4K content delivers a tangible improvement in the consumers viewing experience, unlike Stereoscopic. Add to this the commercial drivers from the display makers and professional equipment suppliers I think we are not many years away. I think one of the over-looked issues with 4K delivery is in the living room. I worry that the number of consumers who have the money to purchase a display large enough and have a large enough space to properly view it in is fairly small. One thing to remember is that sitting too close to a UHD monitor will result all those compression artifacts just coming across in UHD. That may end up being a factor limiting UHD adoption by the public. Head into your local retail outlet and that is what you see, high resolution artifacts. It really looks like crap! 4K is a reality…as with any business it starts with the consumer market, in that market panel manufacturers are giving you no other choice than 4k. 4Kp is a great production format, particularly if you down-rez at the point before encoding into HD. What is likely to happen due to the incessant promotion without any real 4K content (Netflix? Please?) is that the few consumers who are interested who haven’t bought a 4K set will expect it to be a standard feature in their 2K sets, at the same or lower price as today’s 2K sets. This is what happened to 3D, the “previous” 4K. We invite further discussion on here and/or on the Linked-In Groups where this article appears.